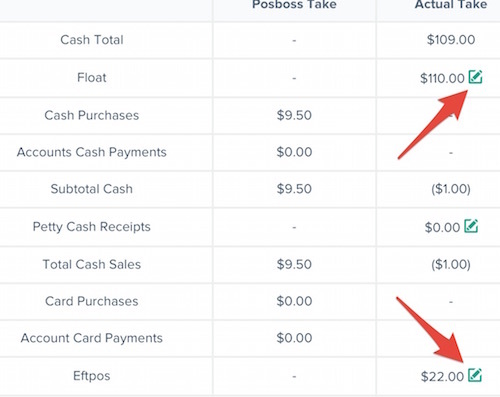 posBoss Management Site - Where you can view and report on each cash up, edit and send the totals through to Xero. Located under Financials > Cash Up. In the management site, go to the Financials tab > Cash Up. All of your cash ups will be listed. Click on the green link of the cash up you want to view/edit. The cash up will open. There are two parts you can view or edit, the Cash Drawer and the Settlement. To reopen, press Settlement, then press the Reopen button . You can switch between cash drawer and settlement and edit the Actual values. To edit the actual take values of the cash up, press the green edit button next to the value you want to change and enter the new value. Once you’re done, click the Finalise button at the bottom. To export cash up information on the management site, go to the Financials tab > Cash Up. Select a whole page of cash ups (1) or select individual cash ups (2). Press (3) Export Selected to download a .CSV file of your cash up data. If you’re reporting on more than a page of cash ups, you will need to run separate cash ups for each page then copy/paste into your spreadsheet app.